Breeding took priority over showing cats in 2015-2016 and the results were awesome! 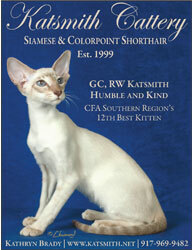 GC, RW Katsmith Humble and Kind (Otto) ended the season as CFA’s 2 highest scoring Colorpoint Shorthair kitten and CFA Southern Region’s 12th Best Kitten. In April Otto went to live in Maryland with Mary Kolencik; he granded quickly and will be shown as an adult in the 2017-2018 season. GP Katsmith Oh Solo Mio (Baby Solo II) went to show with Otto and was shown in the kitten class. Sadie, Jessy (Solo II’s mom) and Ava (Otto’s mother) had litters in 2016. Sea-Lo was retired in November 2016 and lives a life of luxury in Georgia. Solo retired from showing and now lives in FL. The 2014-2015 Show Season started out on a high note and finished really well. GP, RW Katsmith One Track Mind (Solo) granded in 1 show at the Southern Regional show in June; this was the 15th grand for GC Katsmith Dream On, DM (Marco) and the final grand needed for Marco to accomplish the title of Distinguished Merit. I'd like to thank everyone who granded cats out of Marco; Michele Lukic, Mary Kolencik, Cathy Kennedy & Linda Haslow, Pauline Bratt and Virginia Wheeldon. With the help of Mary Kolencik GC, RW Katsmith All-of-Me (Ollie) granded in August and went on to end the season as CFA's 2nd Best Colorpoint Shorthair, CFA's Best lynx point Colorpoint Shorthair, the Southern Region's 25th Best Cat and the Southern Region's Best Colorpoint. In September Solo went to live with Venus DeVoe and the cats of Dynamicat. 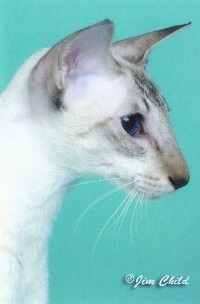 Venus continued to show Solo who ended the season CFA's 3rd Best Siamese in Premiership and the Southern Region's 12th Best Cat in Premiership. Still working on Marco�s DM; but we are close. GC Katsmith Kamora of Thaifong granded in May, GC Katsmith Boys Round Here (Hero) granded in October and went to live with the beautiful cats of Thaifong and GC Katsmith Spellbound (Sara) granded in March; all 3 cats were sired by GC Katsmith Dream On (Marco) which brings the DM countdown to 14. Sara went on to end the season as 3rd Best Colorpoint Shorthair in the Southern Region and 6th Best Nationally. Both Lola and Jessy had kittens in the summer and kitten from both girls will be shown in the new season. In 2013 CFA implemented a new award "The Cat Fanciers� Association, Inc. Cattery of Distinction"; with 22 Katsmith grands I was awarded with a Tier I title. 2013 was supposed to be all about Ava. GC, RW Katsmith Electric Avenue (Ava) granded at the Southern Regional show in June and we hit the road; unfortunately we only made it to 11 shows before she decided she�d rather have babies. Her last show was December 1, 2012 and I just hoped she had enough points to achieve a Regional Win. 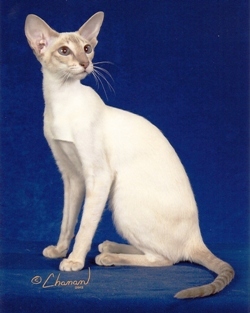 When the season ended Ava was the Southern Region�s 22nd Best Cat and CFA�s 2nd highest scoring Colorpoint Shorthair. GC Katsmith What Ever Lola Wants (Lola) granded in November and GC Katsmith Bubba of SaShai (Bubba) granded in March; both cats were sired by GC Katsmith Dream On (Marco) which brings his DM countdown to 11. I added CH Wi-Wyn Avalon of Katsmith to my bevy of beauties; thank you Sherri for her. Jessy and Kiki all produced beautiful Siamese kittens; and there are now Katsmith Siamese living in Sweden, Canada & Massachusetts. Ava�s kittens were born in February and I�m looking forward to showing them in the 2013-2014 season. The 2011-2012 seasons was a "Grand" season; with 4 new Katsmith grands in Championship and 1 in Premiership. GC Katsmith Same Old Song and Dance (Gino), GC Katsmith Candle in the Wind (Candy), GP Katsmith Dude Looks Like a Lady (Leo) all sired by GC Katsmith Dream On (Marco) granded which brings his DM countdown to 9. In addition to those cats GC Savuti Keys to the City of Katsmith (Kiki) and GC MaryK Temptation of Katsmith (Jessy) granded. Thanks for Linda and Mary for these lovely girls. Roxy and Kiki produced beautiful kittens which I�m very excited to be showing in the 2012-2013 season. This was a stellar year for Katsmith. GC, RW Mezetique Roxy of Katsmith, DM (Roxy) earned the title of Distinguished Merit when GC Katsmith Milargo (Milo) granded in October and CG Katsmith Mamma Mia (Mia) in December. 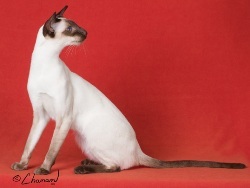 And even though she was only shown once all season, GC, RW Mezetique Roxy of Katsmith, DM earned the title of the Southern Best Chocolate Point Siamese for the 2nd time. Thanks once again, to Melissa for this beautiful cat. 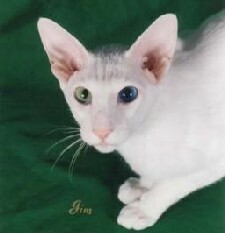 GC, RW Katsmith Wake Me Up Before You Gogo (Hugo) granded in October and ended the season as CFA's 2nd Highest Scoring Colorpoint Shorthair Nationally and CFA Southern Region's 19th Best Cat. Hugo was also the Southern Region's Best Colorpoint Shorthair and Best lynx point Colorpoint Shorthair Nationally and in the Region. 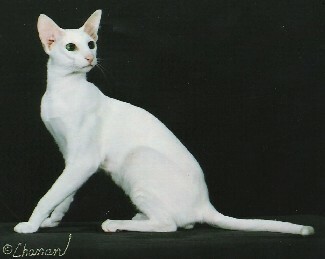 PR Katsmith Amen-Ra one of Marina's offspring and Roxy's grandson ended the season as 10th Best Colorpoint Nationally. He is owned and shown by Lisa Hanlin, thank you Lisa for showing him, good luck next season. 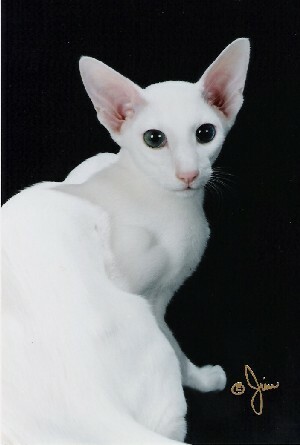 Marco helped the Colorpoint breed along by siring kittens for both Penelane and Melkatz. 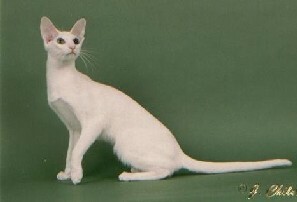 Melkatz Kabuki Dancer of MaryK was CFA's 2nd highest scoring Colorpoint Shorthair kitten and granded quickly at the end of the season. GP Penelane Will I Am, Penelane "Pinky" Pinkerton, Penelane Johnny Rocket & Penelane Sookie Stackhouse were all shown during the 2010-2011 season. Thanks to Melanie, Michelle, Mary and Cathy & Linda! Marco's "grand count" is 3 down...12 to go! Good luck to everyone next season! GC Katsmith Milargo (Milo) granded in October, was neutered and is living in Kissimmee, FL. CH Katsmith Mamma Mia (Mia) granded in December she was bred to Rambo and is the proud mother a litter Colorpoint kittens. 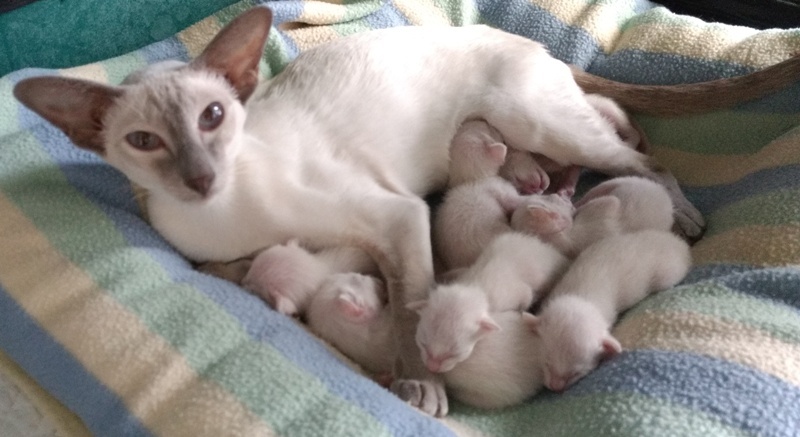 In addition to Mia�s litter, Emmy had a litters of Colorpoint kittens with both Milo & Marco and Roxy had her first litter of Colorpoint kittens with Rambo. Katsmith Fergalicious of Savuti, a chocolate lynx point (Roxy & Rambo) is now living with Linda Patrick & the cats of Savuti and Savuti Keys to the City (Kiki), a chocolate point Siamese is a wonderful new addition to Katsmith, thanks to Linda for this lovely cat. We didn�t show much this season but cat�s from Roxy�s first litter GC Katsmith Marathon (Marina) & GS Katsmith Dream On (Marco) granded over the summer and 2 kittens from Roxy�s second litter GC, RW Katsmith Glitter in the Air (Ari) and CH Katsmith Milargo (Milo) were 1st & 2nd highest scoring Siamese kittens at the CIS. Roxy was there as well and was 2nd best Siamese in Championship. 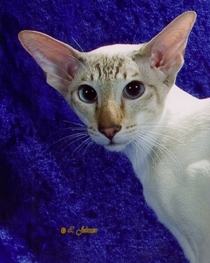 GC, RW Katsmith Glitter in the Air, shown by Debi Stevenson was CFA 2nd highest scoring Siamese Kitten and the Southern Region�s 17th Best Kitten, I am proud to say that this is the first �home-grown� Katsmith Regional Winner. Ari granded quickly at the end of the season and is living with Debbi and the cats of Shimasu. Ari�s littermates CH Katsmith Milargo (Milo) and CH Katsmith Mamma Mia (Mia) attained the title of Champion. In addition to Roxy�s litter, Emmy & Marco had a litter of kittens and Katsmith Wake Me Up Before You Gogo, a chocolate lynx Colorpoint Shorthair will be shown and will eventually take his dad�s (Rambo) place in my breeding program. Roxy did it again! 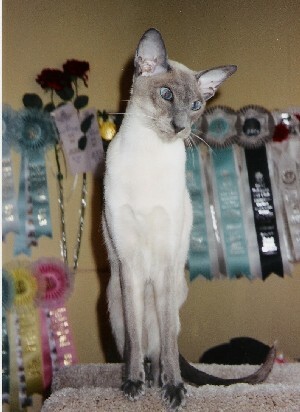 After having a litter of kittens in May 2008 GC, RW Mezetique Roxy of Katsmith returned to the show ring in September. She ended the 2008 � 2009 season as CFA�s 3rd Best Siamese (National Breed Win) and the Southern Region�s 9th Best Cat (Regional Win). She was able to accomplish all this in only 16 shows/101 rings. 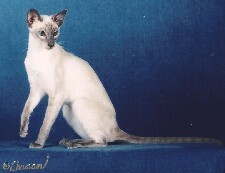 She was also Best Siamese at the CFA International Cat Show (CIS) in November 2008 making all 6 finals. This is Roxy�s 2nd Regional Win; she was 7th best kitten in the North Atlantic Region in the 2007 - 2008 Season and CFA's 2nd best Siamese Kitten. This breed win is very special win because Roxy shares the spotlight with her cousin GC, RW, BW Shimasu's En Vogue of Haute-Ming (Joi) who ended the season as Best of Breed Siamese. Joi�s mother CH Katsmith Amara of Shimasu and Roxy�s father GC Katsmith El Morocco of Elorac are litter mates. Roxy�s kittens CH Katsmith Marathon (Marina) & CH Katsmith Dream On (Marco) were 2nd & 3rd highest scoring Siamese kittens at the CIS. My thanks to Céline Ménard (Naobie) for the lovely Emmy. This past season was a very exciting one for me because GC, RW Mezetique Roxy of Katsmith is my first Regional Win for a kitten. Roxy ended the season as the 7th best kitten in the North Atlantic Region and CFA�s 2nd highest scoring kitten for the 2007-2008 season. 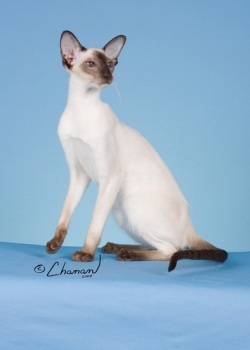 She was also the second best chocolate point Siamese in Championship in the NAR. Roxy is a chocolate point female out of GC Katsmith El Morocco of Elorac and GC, RW MVAble Takira of Mezetique. Roxy was born in Mezetique�s first litter and follows her mother as a RW in Region 1. Roxy finished up her kitten career and granded quickly just before I moved to Florida. She is now retired from the ring and will present me with her first litter in May. I acquired CH SuttonMeows Allison of Katsmith, a blue point Siamese female, and Shimasu Sedona of Katsmith went back to live at Shimasu. I spayed and retired Katsmith Touch-of-Gray, my last Oriental Shorthair, from now on I plan on concentrating on Siamese and Colorpoints. GC, RW Mezetique Roxy of Katsmith earned the title of Grand Champion & Regional Winner, while CH SuttonMeows Allison of Katsmith attained the title of Champion. Thanks to Melissa Horn (Mezetique) for trusting me with Roxy. And Deb Fagerstrom (SuttonMeows) for the sweet Allison. 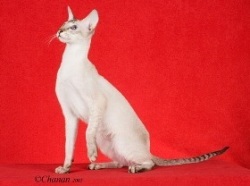 GC Katsmith El Morocco of Elorac granded this season and is the first Katsmith Siamese to grand in Championship. 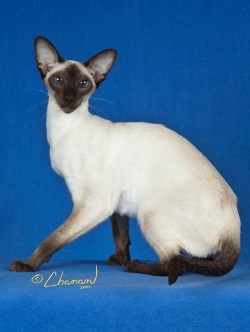 Rocco is a chocolate point male and was born in Katsmith�s first Siamese litter. Rocco was best Siamese in Championship at the 2006 CFA International Show in San Mateo, CA., Best Siamese Kitten in the North Atlantic Region and Best chocolate point Siamese in the North Atlantic Region for the 2006-2007 season. This past season GC Katsmith El Morocco of Elorac earned the title of Grand Champion, while CH Fairydust Darling Nikki of Katsmith and CH Shimasu Sedona of Katsmith attained the title of Champion. I acquired Fairydust Darling Nikki of Katsmith, a chocolate point Siamese female, and Shimasu Sedona of Katsmith a seal point Siamese female. Nikki & Rambo and Stella & Rocco had litters of Colorpoint kittens. Rocco also sired the first litter of Siamese for Mezetique cattery. I spayed and retired Sanlino Stella Blue of Katsmith, her daughter; Katsmith Bicycle Built for Two (Daisy) a seal-tortie lynx point will stay at Katsmith and replace her mother. Thanks to Jennifer Wilson (Fairydust) and Debbi Stevenson (Shimasu) for sharing their lines with me. After granding Katsmith Ramblin� Man, a seal lynx point male in February, he ended the 2005-2006 season as a Regional Breed and Color Winner. 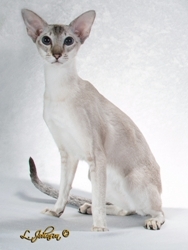 He is the North Atlantic Region�s 2nd highest scoring Colorpoint Shorthair and 2nd best lynx point. He was 5th Best CPSH in CFA (Colorpoint Breed Council Award) and 3rd best lynx point (not awarded). This past season GC Katsmith Ramblin� Man earned the title of Grand Champion, CH Elorac Tuff Stuff of Katsmith attained the title of Champion and CH, PR Crystabel Jet Set of Katsmith became a PR. I acquired Sanlino Stella Blue of Katsmith, a blue cream lynx Colorpoint Shorthair, Gimsin Alfie of Katsmith a blue point Siamese and became the co-owner of Elorac Tuff-Stuff of Katsmith. Tuffy gave me my first litters of Siamese this past season, one of which will take his place as my Siamese Sire. I spayed and retired GC Sydsu Our Lips R Sealed of Katsmith & CH Sydsu Harvest Moon of Katsmith, CH, PR Crystabel Jet Set of Katsmith and retired Gimsin Alfie. GC Elorac Across the Stars of Katsmith my �star� from last season went to live in Quebec where he is making beautiful babies at Naobie cattery. Kittens from Luna and Tuffy went to breeder homes and kittens from Luna, Syd & Tuffy were shown in the later part of the season. Thanks again to Carole Hamelman, I�m pleased to be working with her and her wonderful lines and to Bob Molino & Bernie Hartman (Sanlino) and Ruth & Tom Taylor (Gimsin) for trusting me to help carry on their lines in my cattery. The 2004-2005 season was a very special one for me. Katsmith achieved it�s first National breed win. GC Elorac Across the Stars of Katsmith (Luke) granded in November and went on to end the season as CFA's 3rd Best Colorpoint Shorthair. In addition, he was a Regional breed winner ending up as the 2nd Best Colorpoint Shorthair in the North Atlantic Region (NAR). 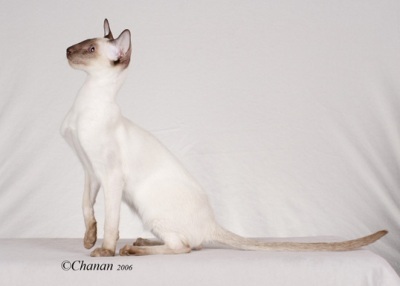 Luke also earned color awards as both CFA�s and the NAR�s 2nd highest scoring lynx Colorpoint Shorthair. CH Crystabel Jet Set of Katsmith earned the title of Champion this season. Like last season, the changes in my cattery this year were significant; I spayed and retired GC Katsmith�s The Girl From Ipanema and CH Crystabel Desdemona of Katsmith. 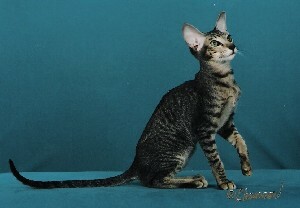 I acquired GC Elorac Across the Stars of Katsmith a chocolate lynx Colorpoint Shorthair and CH Crystabel Jet Set of Katsmith an ebony ticked patched tabby Oriental Shorthair (LHc). Kittens from 2 litters, Balinan All Shook Up of Katsmith & GC Sydsu Our Lips R Sealed of Katsmith and GC Elorac Across the Stars of Katsmith & CH Sydsu�s Harvest Moon were shown at the end of the season. And what a way to end the season!!! Both Katsmith�s My Girl (Mya) and Katsmith Moonshadow (now Katsmith Emilie of Balinan) finaled as Best All Breed Kitten at Sign of the Cat. I am very excited to be working with Colorpoint Shorthairs. My first Colorpoint litter was born in February and I can�t wait to start showing them. 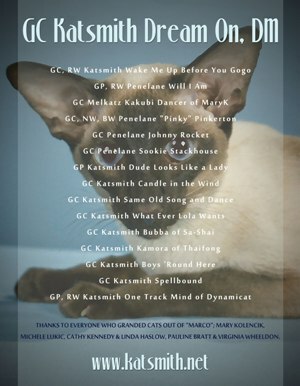 Thanks to Carole Hamelman and Christine & Isabelle Arnau for adding their lines to my cattery. GC Sydsu Our Lips R Sealed of Katsmith granded and ended the season as CFA's 12th best Oriental-Shorthair Division in Championship and a National and Regional color winner. Both CH Sydsu's Harvest Moon of Katsmith and CH Crystabel Desdemona of Katsmith earned the title of Champion. 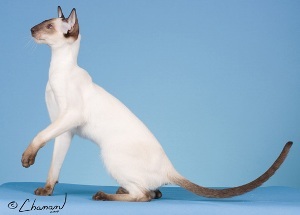 I made some extensive adjustments to my breeding program and I feel ready to meet the challenge of breeding bi-color Oriental Shorthairs head-on. I spayed and retired CH Bel Canto Nick-of Time of Katsmith and GC Crystabel's Georgy Girl of Katsmith and I neutered and retired Purrmatix Iron Man of Katsmith. I acquired 4 new cats; Syd, a female ebony spotted tabby & white bi-color Oriental Shorthair, Luna, a calico smoke Oriental Shorthair, Mona, a female seal point Siamese and Al, Balinan's All Shook Up of Katsmith a male ebony ticked tabby & white bi-color van Oriental Shorthair (LHc). These 4 cats, along with Ema, Katsmith's The Girl From Ipanema a female odd-eyed white Oriental Shorthair comprise my entire breeding program. I am excited to be working with these lines and look forward to many happy & healthy kittens. Thanks to Susan James, Christine & Isabelle Arnau and Nancy Grandison for adding their lines to my cattery. I'm thrilled to be working with them. Katsmith has it's first DM!! CH Geishagol Dazzlin Ice of Katsmith, DM achieved the title of Distinguished Merit when GC Katsmith's The Girl From Ipanema granded in February 2003. Ema is the 4th Grand Champion sired by GC, GP, RW Crystabel's Eye'm Odd of Katsmith. CH Bel Canto Nick-of-Time of Katsmith became a Champion. I decided to take my breeding program in a new and exciting direction. 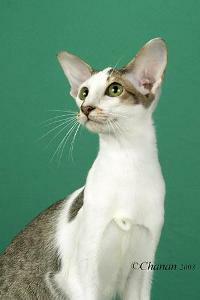 With the addition of Nicky, a calico smoke Oriental Shorthair I hope to be breeding bi-color Orientals soon. GC, GP, RW Crystabel's Eye'm Odd of Katsmith is a Regional Winner!! He was 11th best cat in Premiership in the North Atlantic region and CFA'S 4th best Oriental (Shorthair Division) in Premiership. In addition my first Katsmith grand, GC Katsmith's Dark Side-of-the Moon won a regional breed award and a regional color award. I also granded 4 cats: GC Katsmith's You Can Call me Al, GC Katsmith's Whole Lotta Love and GC Crystabel Georgy Girl of Katsmith all in Championship and GC, GP, RW Crystabel's Eye'm Odd of Katsmith in Premiership. CH Katsmith's The Girl From Ipanema and CH Leggs Cecilia of Katsmith both achieved the title of Champion. I've added Crystabel's Georgy Girl of Katsmith and Leggs Cecilia of Katsmith to my breeding program. Al has moved to California as an addition to the breeding program at Kat Attack. Lottie and Tibby were both spayed and retired. Katsmith produced three litters of kittens this season. Oddy�s daughter, Ema will stay with us. This was a busy year, now that I�m breeding and showing my own cats as well as those of other breeders. GC Crystabel's Eye'm Odd of Katsmith was a regional breed winners and a national color winner in Championship. I granded the first Katsmith bred cat, CH Katsmith's You Can Call Me Al and Katsmith�s Whole Lotta Love achieved the title of Champion as did CH Crystabel�s Georgy Girl of Katsmith. The first litter of Katsmith kittens were born in July. One has already granded and two more on are on their way. This was my first season of showing cats and a very exciting one. I granded GC Crystabel's Eye'm Odd of Katsmith and GP Elorac Indigo Eros Atari Brady. These were the first cats I granded and both cats granded on the same day. I also decided that I wanted to try my hand at breeding and I acquired Dazz, a Siamese female to breed to Oddy.